There's nothing quite like Mardi Gras and spending the holiday on The Plains is something special. 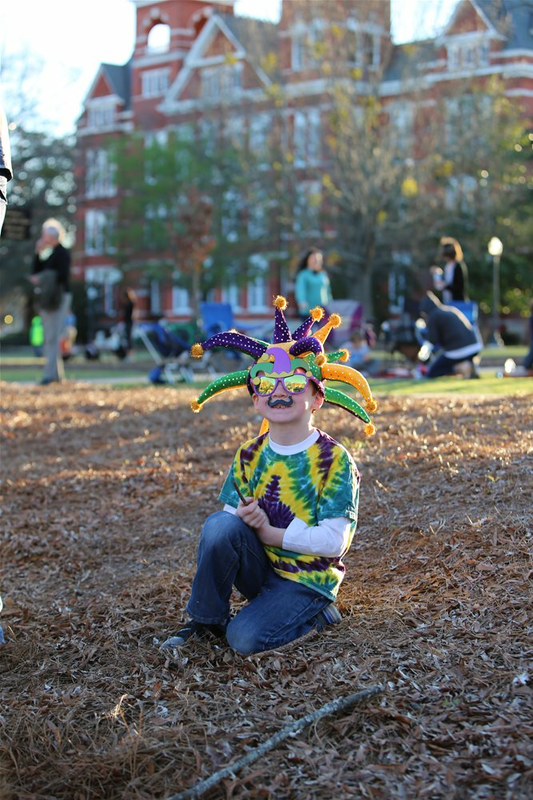 Check out these fun ways to celebrate this Mardi Gras in Auburn and start making your plans for this weekend! 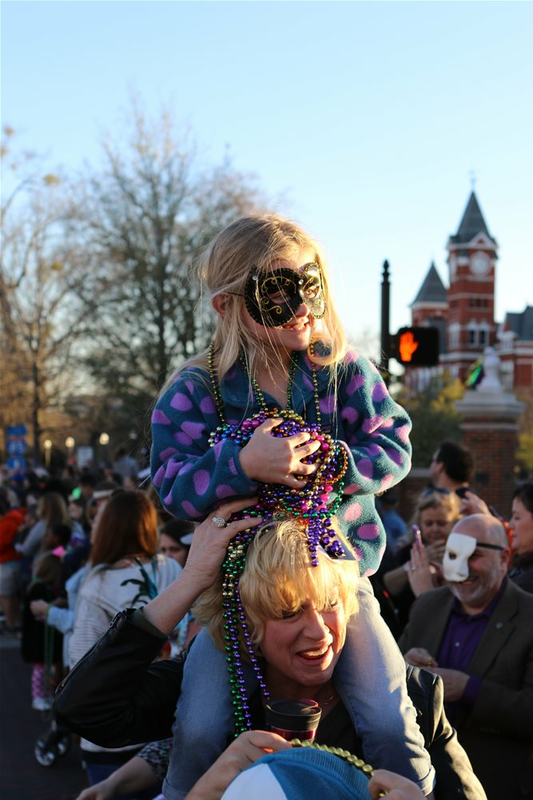 The Mardi Gras parade will be held on March 2 at 2 p.m. Come out to Downtown Auburn to check out the floats, enjoy the music, and catch some beads! The parade is put on by Krewe de Tigris. The Krewe is a social organization dedicated to bringing year-round fellowship with family, friends, and the community with an emphasis on the Mardi Gras season. "The Krewe began out of a need from area community members to celebrate Mardi Gras and community. January 31, 2015, was when it began," said Councilwoman and Krewe founder, Beth Witten. "Each year we have a new theme. This year's theme is Let the Good Times Roar. We have added more floats this year." This year's Krewe King and Queen will be father/daughter duo, Barry Dorman and Chelsey Settles of Auburn. The streets downtown on the parade route will close at 1 p.m. in preparation for the parade. A full map of the parade route can be found below. 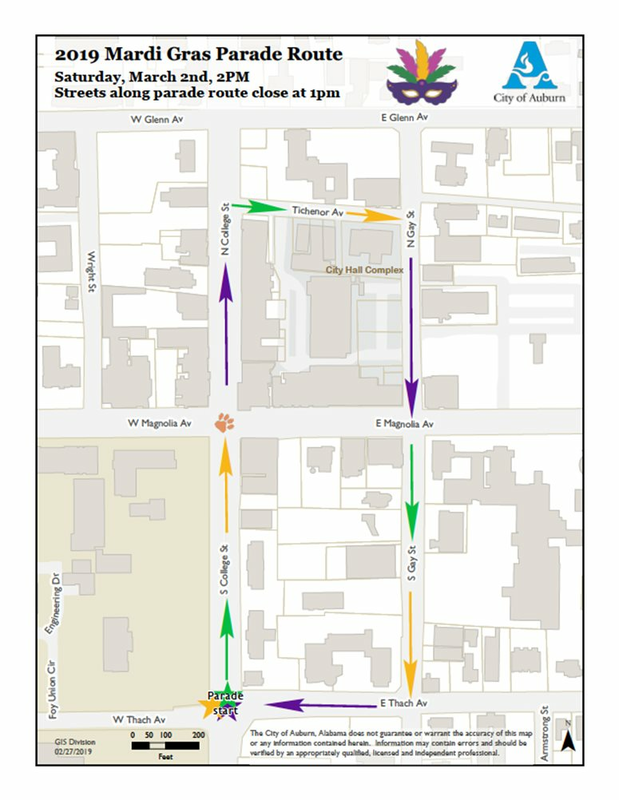 Get some shopping in while you enjoy the Mardi Gras festivities in Downtown Auburn! In conjunction with the parade, the Downtown Merchant's Association will host its annual Krewe Krawl. The Krewe Krawl features exclusive specials at downtown shops and restaurants for those who purchase a wristband. It begins at 10 a.m. and lasts all day so you have plenty of time to browse and celebrate. Wristbands will be available to purchase at select businesses starting on February 25 and will also be available the day of. Wristbands this year will get you 25% off your entire purchase at Behind the Glass, $2 draft beers at Hamilton's, and buy one get one 50% everything at STAMP - just to name a few. A full list of discounts and specials included with this year's Krewe Krawl wristband can be found here. Along with the discounts, a wristband also gets you no cover charges at Moe's BBQ, Bourbon Street, 17/16, and Quixote's. Ross House has some seriously amazing coffees you've got to try for Mardi Gras! You can choose a King Cake Latte with cinnamon and white chocolate, a Mardi Gras Mambo with lavender and honey, or the Throw Me Something Frappe with matcha and lavender. You can't go wrong with a good, festive cup of coffee! While you're there, try a pastry with your coffee and be on the lookout for special Mardi Gras items! The Auburn Popcorn Company is serving up a Mardi Gras mix to make you say "yum!" The mix is fresh, candy-coated lemon, grape, and green apple flavored popcorn. Stop in before the parade and get a bag of the Mardi Gras mix to have the perfect festive snack! Don't forget to try some homemade fudge or a scoop of ice cream while you're there and don't be surprised if you head back for seconds! Stinky's Fish Camp will be having a crawfish boil on March 2 following the Mardi Gras parade in Downtown Auburn. The boil will kickoff at 2 p.m. and run until the crawfish run out! This will be the first crawfish boil hosted at Stinky's of the year so catch some beasds and head over to Stinky's for a fun Cajun tradition!